On June 23, 2014, Bay Area Generations hosted our 10th edition at the Berkeley City Club, with guest curator Evan Adams. 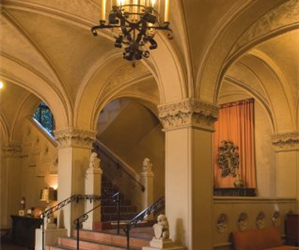 It was the third time at this beautiful venue which architect Julia Morgan described as her “little castle”. The BCC is an official California Historical Landmark and is listed on the National Register of Historic Places, noted for Morgan’s interpretation of combined Moorish and Gothic elements. It made a perfect setting for a remarkable group of readers and musician Run Yang Liu.